Whatsapp is a most popular and widely used Messenger app on smartphones. Every internet user prefer to use messenger apps like whatsapp instead of using sms. There are a number of best messenger apps for android device. We can even download whatsapp on PC. But widely whatsapp is used for texting on mobile. We can easily share files on whatsapp as well as text and call our Whatsapp contacts. But the most common issues which is now in a problem for whatsapp is, it’s yearly subscription. We all know whatsapp free for lifetime is not available. Whatsapp provides 1 year subscription service which we have to extent buy paying $1 for each year as service charge. But the most common issues users are facing due to many reasons is they are not able to pay whatsapp service charge for payment method issue or others. Due to these numerous reasons people will not able to enjoy whatsapp. Don’t worry here is little solution for those guys to use whatsapp free for lifetime. You just have to follow below given steps to make whatsapp service lifetime for free without paying any money. If you are currently using whatsapp on your device then your free service time period should be going on. As You can check your current subscription time period as following. Open Your whatsapp account then go to settings tab >> Then Account tab >> Payment info. Now Check out your current service expiration time period. If your is any specific date that means it not lifetime. If they show lifetime then you don’t need worry about anything. As you can see below whatsapp lifetime service screenshot of my account. If whatsapp subscription is not currently lifetime then don’t worry. You just need to do these follow small tricky methods. First of all you need to understand how whatsapp service time period works. Whatsapp service assigns mobile number based subscription. That means if 1 mobile number is considered as 1 account. But subscription time period depends on Mobile IMEI number or in other words device to device. Now to make your whatsapp service free for particular mobile number. You need to arrange fresh device where whatsapp is never installed. Like you can use your parents, relatives etc who don’t use internet or don’t have any interest in whatsapp. Simply ask them to give you device for 5-10 min. Then you need to uninstall whatsapp account using that particular mobile XXXXX whatsapp number which you make free for lifetime. After uninstalling from previous device. Download whatsapp fresh device which you borrow. Then to activate subscription use your current XXXXX mobile number which you want to make lifetime. After verifying mobile number then again check your current service time period in payment info. If it not works then try on other devices. Follow this process on 3,4 devices then your whatsapp time period will automatically turns into lifetime period. Note:- Specially on MI devices chances to use whatsapp lifetime service subscription is more that any other like Samsung or iPhone. Important Update:- Recently Whatsapp announced regarding whatsapp service period and they extended it for lifetime for all users and also it will stay ad free messenger. So now, we don’t need to follow any particular task. 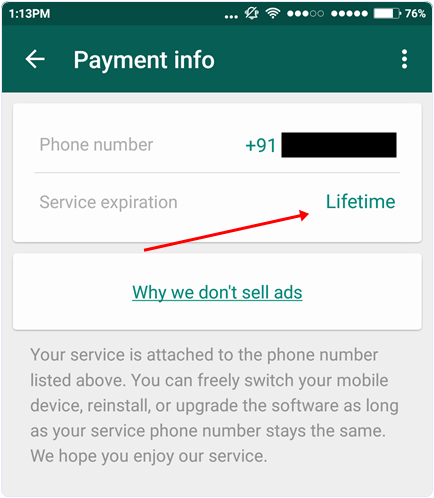 If you want to confirm your current whatsapp service is free for lifetime or not then, you can check it on payment info options. Above explained process is outdated. So we request to don’t need to follow anything to use whatsapp free for lifetime (Updated On 1 Jan 2016). We feel that this method to use whatsapp lifetime service for free which be helpful for you. We even hope it works fine because we have tested this method manually to use whatsapp free for lifetime. But some how if its not working then we recommend you to pay services charges to support developers. But if you are not able to pay then take help from someone who know more about using internet than you to pay for you. If you like this method then don’t forget share it with your friends.